VEKA announces the retirement of valued twenty-eight year employee and North American Board Member, James Druschel - Vice President of Finance and CFO. Jim was first employed with VEKA on February 1st, 1990. During his tenor, Jim has been one of the most respected and trusted colleagues within the VEKA group and carries that same respect and admiration throughout the industry. His contributions to VEKA are numerous and Jim has been instrumental in the successful expansion of VEKA to all North American sites over the past 28 years. Jim’s last day as VP and CFO for VEKA will be December 14, 2017. 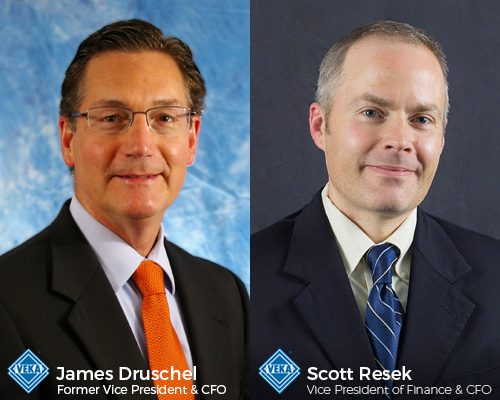 With the coming of Jim’s retirement, VEKA announces as his successor Mr. Scott Resek, the new Vice President of Finance & CFO. Mr. Resek comes to VEKA with outstanding credentials having worked in different finance management and business management roles at Kennametal, ARDEX and PPG Industries. We would like to wish Mr. Druschel good luck in his retirement and Mr. Resek many years of success in his new role with VEKA.